True luxury Bayfront living in your own secluded setting nestled in the dunes of Cape May Beach! Coastal living at its finest! VIEWS! SUNSETS! BEACHES! 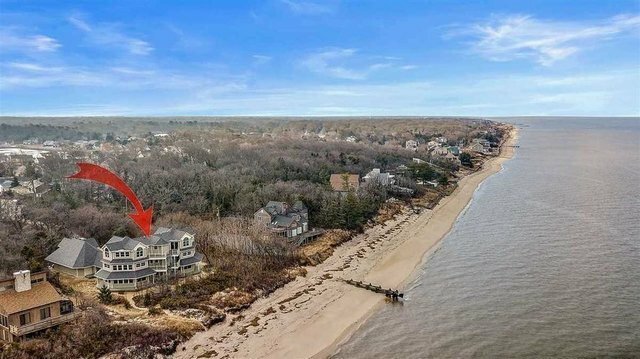 You will be thrilled and awed by this spectacular custom built 6-bedroom, 6.5-bathroom home with its own charming path to the white sandy beaches and cool waters of the Delaware Bay beaches. Enter this 1.1-acre property from a private windy drive that takes you past lavish plantings and lush landscaping. As you approach the home you will be struck by the craftsmanship and appealing aesthetic. A wrap around first floor porch and classic solid wood double front doors take you inside to a dramatic foyer with coastal white tile flooring, appealing wall tones and a graceful ascending staircase. The first floor offers 4 very spacious bedrooms with lots of natural light, each with their own private bathrooms finished with decorator tile and vanities. Take either the 3-stop elevator or easy-to-climb staircase to the second floor where you will find two magnificent master suites with sitting areas and fabulous designer bathrooms. Truly a dream with views and lots of space. Each suite has access to decks and a staircase to ground level and the beach! The third floor offers gleaming hardwood flooring, panoramic views of the bay and world class sunsets! Amazing chefÃ¢â‚¬â„¢s kitchen ideal for entertaining and wowing your guests features a huge arced island that can seat up to 12! Stylish raised-panel white cabinetry, tile backsplash, stainless appliances and striking granite countertops flanked by windows make this kitchen worthy of the most discerning tastes. The dining area is conveniently located adjacent to the kitchen and can also seat 12. The main living room has windows on all walls for maximum enjoyment of bay breezes and views. Sit out on the decks and bask in the peace and serenity of abundant nature, privacy, soothing sights and sounds and utter peace. Attention to detail, location, size and first-class finishes make this home turn-key. It can be sold furnished, minus some family heirloom furniture in the first-floor bedrooms, at a mutually agreed upon price. Live the dream. You deserve it! Extras include: Huge unfinished bonus room above the garage with HVAC, 3-car spacious garage- already wired and ready to install auto-door openers, 4 Bosch on demand hot water heaters, Rental history of 7K per week, extra solid construction 105 pilings, 130 MPH shingles, drainage on decks, Low-E windows, professionally landscaped, custom window treatments and so much more!! Schedule your private showing today!